Tuesday’s release of December state employment and unemployment data from the Bureau of Labor Statistics capped a year of steady progress for most state labor markets. All but seven states gained jobs in 2015, and all but eight ended the year with lower unemployment than in December 2014. The states that lost jobs were almost exclusively states where the energy sector plays an outsized role in the state economy and where falling energy prices have led to cutbacks in oil and gas production: Alaska, Louisiana, North Dakota, Oklahoma, West Virginia, and Wyoming. Similarly, only two states (New Mexico and West Virginia) had meaningful increases in unemployment over the past year, also likely the product of cutbacks in oil production and coal mining. In the final quarter of the 2015, 43 states and the District of Columbia added jobs, with Idaho (1.8 percent) Arizona (1.6 percent), and Tennessee (1.3 percent) having the largest percentage job growth. 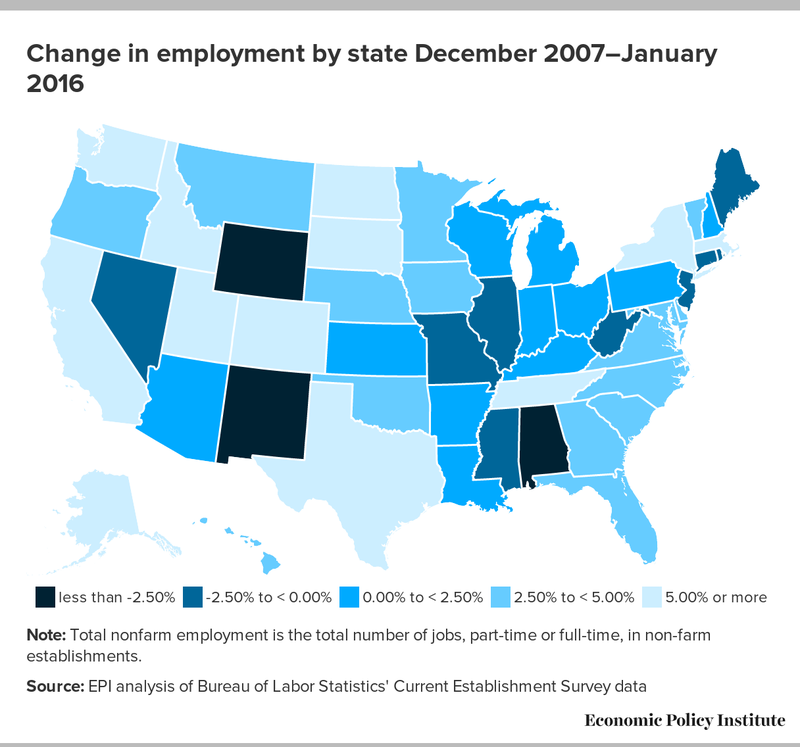 During the same period, six states lost jobs, with North Dakota (-1.7 percent), Wyoming (-1.1 percent), and Louisiana (-0.5 percent) posting the largest percentage losses. Over the full year (December 2014 to December 2015), Idaho (4.4 percent), South Carolina (3.3 percent), Utah (3.2 percent), and Oregon (3.0 percent) had particularly strong job growth. Over the same period, the U.S. averaged 1.9 percent job growth. With some exceptions, these states experienced job growth outpacing the national average in all major industry categories. All four states consistently outpaced the national average for growth in education and healthcare, leisure and hospitality, and government employment. 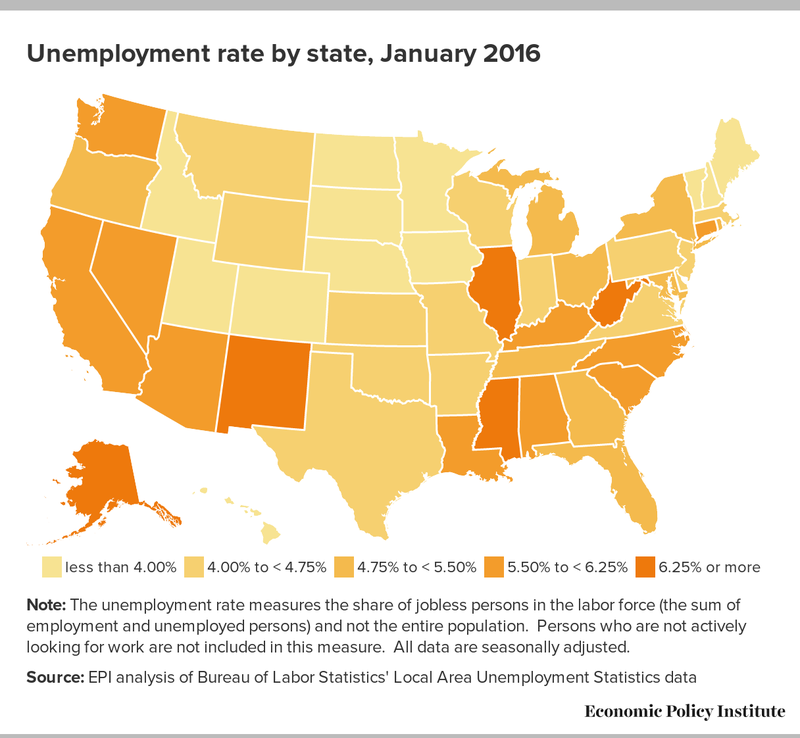 From September 2015 to December 2015, unemployment rates fell in 32 states and the District of Columbia. West Virginia (-1.0 percentage points), Missouri (-0.9 percentage points), and Oregon (-0.8 percentage points) had the largest declines in unemployment. Missouri’s and Oregon’s changes seem to be unambiguously positive news. The lack of any job growth in West Virginia over this same period suggests that at least some of the decline in the state unemployment rate is due to job-seekers giving up the job search, although it is possible some previously unemployed workers may have found work outside of the state. Over the same period, unemployment rose in 13 states, with the largest increases occurring in Illinois (+0.5 percentage points) and Texas (+0.5 percentage points). The unemployment rate was unchanged in 5 states. Over the year, Rhode Island (-1.7 percentage points), Maine (-1.5 percentage points), Indiana (-1.5 percentage points), California (-1.3 percentage points), Michigan (-1.3 percentage points), and Oregon (-1.3 percentage points) had the largest declines in state unemployment rates. Although 2015 was another year of positive momentum in the health of state labor markets, there is still considerable room for improvement. At the national level, fed policymakers should hold off on future interest rate hikes until a tighter labor market registers real growth in workers’ paychecks. At the state level, the lesson of 2015 is that making investments in a diversified economy leads to stronger job growth and protection against volatility in energy prices. States that invest in their educational systems and bolster their public sectors tend to be more productive over time and more resilient in the face of economic downturns.